The Flaming Lips spent most of the 80s in the wilderness of rock and roll. They put out a series of albums – beginning with 1986’s Hear It Is – that were alternatingly weird art pretension and stabs at mainstream rock filtered through a lot of drugs. A lot of drugs. It took a few records to hit a stride but in 1990 the band released In a Priest Driven Ambulance – the LP where everything seemed to coalesce in a way it had not before. Two years later the Lips released Hit to Death in the Future Head — an album that created a dynamic vision of the band’s sound, hazy and shattered in parts, falling just short of brilliance. 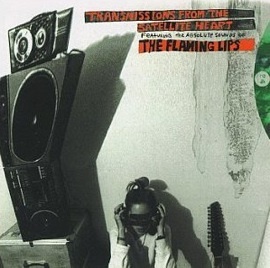 Released in 1993 Transmissions from the Satellite Heart is the first record by the band that is both truly brilliant in its art but also uniquely focused as the fuzz of their work becomes more clearly defined. Where in the past the larger shapes of songs were sacrificed to the noise, here the noise is harnessed (as beautifully displayed in the first track and album’s second single, “Turn It On.”) This is also the first time we hear the truly cavernous rhythm section recorded for the album. The drums, already an important fixture on past releases, are turned up even further in order to cut through the haze. It’s this thicker sound that elevates Transmissions above its immediate precursors. While the record still features the noise driven psychedelia of their early material, everything here seems that much easier to ‘get.’ Transmissions, despite its feet still being planted firmly in the first half of the Lips’ career, is really the beginning of the trajectory that has carried the band into its post-Soft Bulletin career. Songs like “Moth in the Incubator,” a song that on any previous record might have seen its fuzzed out apex spin off into unclear, undecipherable whimsy, here becomes a focused rave up. “When Yer 22” is like a proto-“Do You Realize” – a song built around vague insights into life, nothing revelatory, but strangely poignant when crooned in Wayne Coyne’s cracked voice. And truly I’d be remiss not to talk about “She Don’t Use Jelly.” Despite its near omni-presence in alt-culture at the time, including the performance in a still-bizarre-by-any-standards guest spot for the band on Beverly Hills: 90210, it is a defining song for the success of indie at breaking the mainstream following Nirvana’s not-so-unpredictable-but-still-surprising success. Like any great pop song, the lyrics are almost meaningless. Magazines, tangerines, etc. We get it. But the sing along value is unquestionable and that can’t help but give a song a boost when it comes to success. The whole album benefits from the elevation of factors like this that were present in their music the entire time. I wouldn’t hesitate to call it one of the 90s best indie/alt/whatever-adjective-was-appropriate-at-the-time albums, especially as it holds up just as well over 16 years later. These records (and “Clouds Taste Metallic,” which followed shortly after these, are truly ther band’s high water marks. What they all have in common is Ronald Jones on guitar. He brought a new. more varied approach to the band’s songs and is missed greatly. They have never been the same since he left. I saw a record missing in that discography that i think deserves some mention. Telepathic surgery was the first time i felt the Lips really started to hone in on their particular sound. With amazing songs like Right Now, Drug Machine in Heaven, and Chrome Plated Suicide. This is my favorite album of the first half of their career. I treat this album and Cloud Taste Metalic in a sort of a volume 1 and volume 2 (Rubber Soul+Revolver kinda thing). I adore this record. It was my first lips record I ever picked up as a teenager, and it floored me. Bent my mind a bit but has wonderful pop melodies that drive Ronald Jones madness. So ya I’m in agreeance with you Stephen, I miss Ron. I was really happy to see this record up here. Thanks! @Yair – Clouds.. is probably my personal favorite. It’s an amazing record. I understand why Transmissions.. was the higher seller – it really is a more focused pop record than Clouds.., but not the better of the two. So, I’m with you about treating them as a pair. If people talk to me about the Lips, I always mention those two albums together. I don’t think of them any other way, really. “These records (and “Clouds Taste Metallic,” which followed shortly after these, are truly the band’s high water marks. What they all have in common is Ronald Jones on guitar. He brought a new. more varied approach to the band’s songs and is missed greatly. Steven, you are so right about this. Jones is highly regarded among longtime fans and left a big impact on me when I was learning how to create guitar noise and mess around with effects/sounds as a youngster.